Introduced in the 1890's and now extremely popular with experienced wet shavers. The flat stainless steel blade, platinum coated and sharpened on both edges, offers a simple but effective single cutting action similar to that of an open cut throat or straight razor. 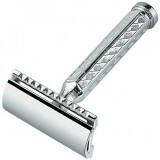 The chrome plated moustache and eyebrow razor is a three piece single edged razor designed to giv.. This fine, nickel plated Merkur razor is a replica of the original 1904 Gillette, the original do..
Merkur Safety Razor 'Futur' - Chrome. 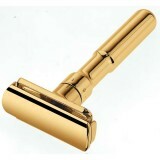 Supplied in a metal presentation box with 10 Merkur razor b..
Merkur Safety Razor 'Futur' - Gold Plated. 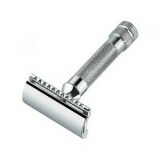 Supplied in a metal presentation box with 10 Merkur ra.. 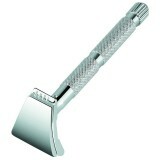 This Merkur 'Open Tooth' 39C Double-Edge Razor features a magnificent polished chrome handle with..
Made by Merkur in Solingen Germany, one of the worlds finest manufacturers of shaving equipment. .. 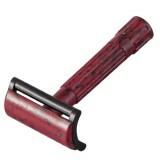 This three piece red and black mottled razor is manufactured from Bakelite plastic making it a st.. 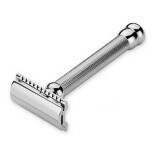 The chrome plated 15C is an open comb (toothed) three piece doube edged razor designed to give a ..
Merkur Long Handle Open Comb 25C safety razor in chrome finish. The 25C features a similar 3-piec.. 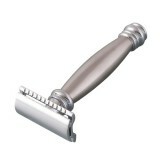 The chrome plated 33C is a three piece, lighter weight version of the legendary Merkur 34C Heavy .. 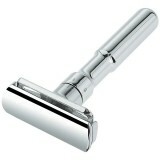 The chrome plated 34C is a three piece, heavier weight version of the Merkur 33C. It utilises the.. 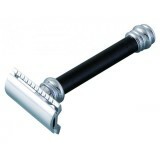 This Merkur 38C Black Double-Edge Razor, features a magnificent Matte Chrome Handle and is very p.. 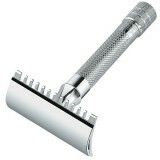 This Merkur 38C chrome double-edge razor, features a magnificent knurled chrome handle and is ver.. 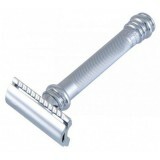 This Merkur 38C Red Double-Edge Razor, features a magnificent Matte Chrome Handle and is very pop.. 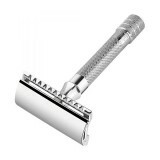 The Merkur 43C is one of the heaviest safety razors made. 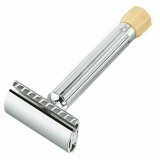 The bulbous shaped matte stainless stee.. 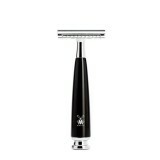 The Merkur 47c features a long Engine Turned handle with the classic and effective Merkur razor h..
MÜHLE RYTMO - High-Grade Black Resin Safety Blade Razor. 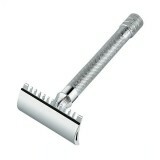 ..
MÜHLE RYTMO - High-Temperature Treated Ash Safety Blade Razor. ..